How to Play MP4 on Apple TV 4 Successfully? You might notice that your video’s extension name is MP4. So you think you can play it without any hassle on any device like your new Apple TV 4. If I tell you that it is not sure that your Apple TV 4 must be able to play MP4 videos, you will be shocked. No audio or no video/image while playing MP4 on Apple TV. Why can’t play MP4 on Apple TV 4? So, you can’t play H.265 MP4 on Apple TV 4 and if your MP4 is encoded with AC3 audio, you will have audio issues when playing MP4 files on ATV 4. So if you have some unsupported MP4 files, how can you play them successfully on Apple TV 4? Actually, you can use a Video Converter to convert unsupported MP4 to MPEG-4 MP4 with AAC or H.264 MP4 with AAC. Pavtube Video Converter Ultimate/iMedia Converter for Mac are recommended here as the ideal MP4 to Apple TV 4 Converter. With it, you can batch convert any SD or HD even 4K MP4 to Apple TV 4 supported H.265/MPEG-4 .mov.mp4.m4v. Besides MP4, this MP4 to Apple TV 4 converter also can convert SD/HD/MKV, H.265, Tivo, VOB, etc to Apple TV 4/3/2/1. What’s more, Pavtube MP4 to ATV Converter offer optimized preset for Apple TV. Now follow the easy steps below to change MP4 to Apple TV compatible formats. How to transcode MP4 to Apple TV 3 for playling? Click the “File” to import MP4 files to the program. Or directly drag MP4 to the programe. 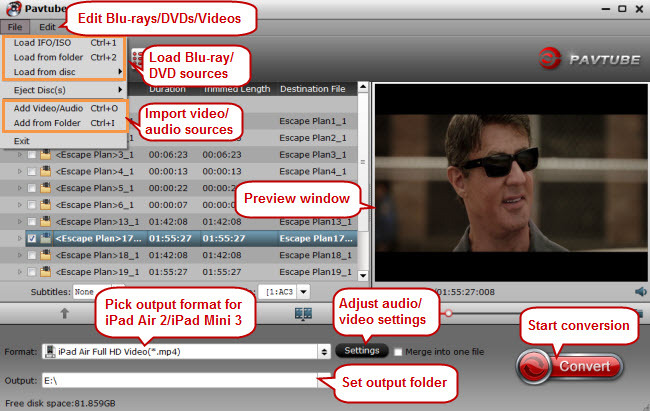 If you want to convert in batch, this powerful converter also supports you to convert several MP4 files at th same time. 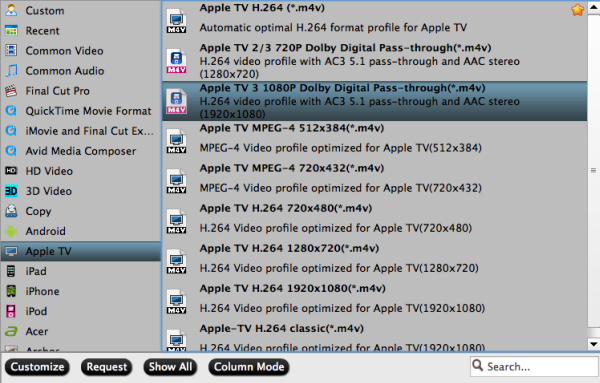 Click “Format” button in lower left corner of the programe, and choose an output format for Apple TV 4. “Apple TV” option is a good choice, then you can choose “Apple TV 3 1080P Dolby Digital Pass-through(*.mp4)" which is also for Apple TV 4. Or you can also choose MP4, MOV, M4V from “Common video”. In addition, you can click on “”Settings” to adjust the settings as follows: Video(codec: H.264; Resolution: 1920*1080; Frame Rate: 24 fps; Bit rate: higher value ); Audio(Codec: AAC; Channel: 2 Channels stereo; Sample Rate 44100Hz; Bit Rate: higher value). These special features can give you a lot of convenience. Click the convert button to start the MP4 to Apple TV 4 supported formats conversion, it will be finished with 6x fast speed and great output quality. How to play a video file (mp4) in AppleTV? play the file in the laptop and mirror the screen via AirPlay on the AppleTV. import the file into the ITunes in my laptop connected to my home network, enable home sharing, and make AppleTV play this file from the ITunes. For more Apple TV related topics and hot issues, please visit our Apple TV page. ← Previous Previous post: How to Play MP4 Files on Samsung TV without any Hassle?